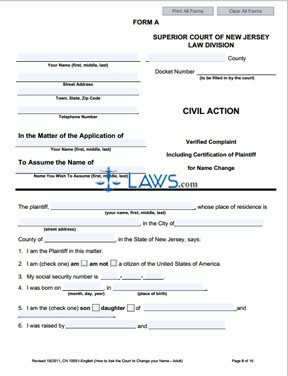 Make a copy of each form and file the originals and copies with the Superior Court in the petitioner’s county. The filing fees are $200.00, and the petitioner needs to pay by check or money order made payable to Treasurer, State of New Jersey. Provide a stamped, self-addressed envelope with the forms. If you have a criminal record, you need to send a Verified Complaint and Order Fixing Date of Hearing to the Director of the Division of Criminal Justice in the city of Trenton at least 20 days before the hearing. You need to publish the Order Fixing Date of Hearing with a local newspaper. The Order needs published at least two weeks before the date of the hearing. After publication, the newspaper will send the petitioner an affidavit. Make a copy and send the original to the court. After you’ve mailed copies to the court, make sure you receive a green certified mail receipt from the post office. Then, attend the hearing and be ready to answer any number of questions in front of the judge. If the name change is approved, the judge will sign the Final Judgment. You need to publish this form in the newspaper as well with all information except for your social security number. Make sure to publish the Final Judgment no more than 20 days after the hearing. The newspaper will send you another affidavit. Make sure this form is submitted to the court. You need to order certified copies of the Final Judgment. Each copy will cost $10.00. Make sure you send certified copies to the Department of Treasury and the Registrar of Vital Statistics. You need to submit a copy in person to the Motor Vehicle Agency or Regional Service Center as well. There is a $50 fee with the for changing your records with the Treasury, and there is a $2.00 processing fee with the Registrar of vital statistics as well as a $27.00 fee if you change your birth certificate.